CKD Galbraith has launched two productive farms in Lanarkshire on to the market. These two sales together amount to a total of 626.99 acres (254 hectares) of land for sale, the most significant area of agricultural land to come to the market in this part of central Scotland for a number of years. Basket Farm and accompanying land at Calderdale equates to 149.69 hectares (369.88 acres) in total. The farm is a mixed use unit with grade 3.2 and grade 4.2 arable and grassland. There are a range of modern farm buildings and a silage clamp plus the potential to build a farmhouse, subject to the relevant planning consents. The land is currently used for livestock and arable and also includes areas of amenity woodland along the Calderside Glen. The current owners have undergone a programme of improving the land and have invested in draining and re-seeding many of the fields in recent years which has significantly improved the grass swards and a number of fields have been used for cereals. Lodgehill Farm and land at Stewartfield, by Blantyre, is a productive stock farm with an attractive three-bedroom farmhouse and an excellent range of modern farm buildings. The land and steading offers capacity for in the region of 130 cows and calves in addition to finishing or store cattle. Lodeghill Farm extends to 46.22 hectares (257.51 acres); the accompanying land amounts to 57.78 hectares (143.38 acres) and has been used for grazing or fodder production. There has been an ongoing programme of investment to maintain the quality of land and improvements have also been made to the fixed equipment on the holding in recent years. 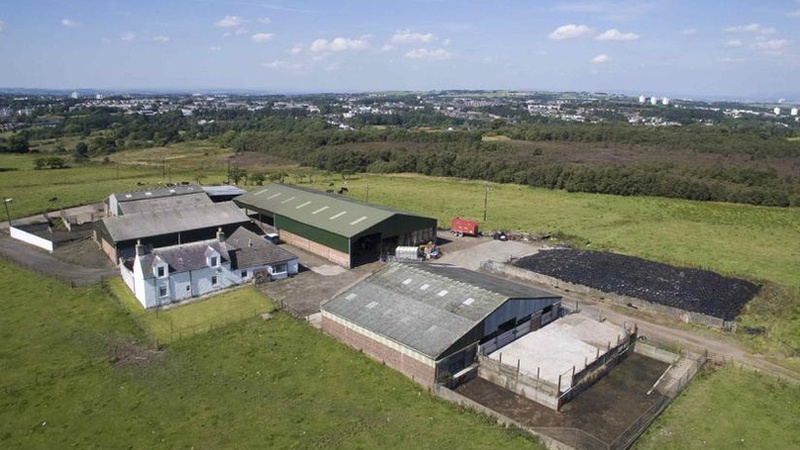 The farms present a rare opportunity to acquire a substantial and productive mixed farming enterprise located in an extremely accessible location close to local amenities and Glasgow. The flexibility of the land, the quality and range of the farm buildings, coupled with the scope to add to the current residential accommodation are likely to appeal to a wide number of buyers both locally and further afield. The farms are both extremely accessible as they are in close proximity to each other and situated only a few miles from the M74, offering easy access to Glasgow and the south. CKD Galbraith recently reported that Scottish farmland is in high demand with buyers coming not only from across the UK but also from Ireland and mainland Europe. CKD Galbraith has marketed 75 million worth of agricultural property over the last 12 months. Basket Farm and the accompanying land at Calderdale, by Blantyre, is for sale either in two lots or as a whole. Lot 1: Offers Over 650,000 Lot 2: Offers Over 320,000. Or as a whole: Offers Over 920,000. Lodgehill & Stewartfield, Blantyre, is for sale in two lots or as a whole. Lot 1: Offers Over 485,000 Lot 2: Offers Over 280,000 As a whole: Offers Over 765,000.